Pete's Blog & Grille: Top 10 Iris Cat FAQs. Top 10 Iris Cat FAQs. Instead of a regular card this past Valentine's Day, I bought my wife Helena an electric sign. It went on the sill in our front window where--our neigbour Delanie was quick to point out--our cat Iris usually sits. In fact, Delanie suggested that Iris might be miffed at the sign. So, somebody in our house came up with bright idea of letting Iris send the occasional message to the world. "I'll be very upset when you get bored of this game." It came courtesy of one of my favourite people, my Goddaughter Aemelia O'Callaghan. All you need to know about Aemy is she named her daughters Faye Lovely and Ivy Darling. But what her Facebook message meant is that we're on the hook for the freakin' sign until either Iris abandons her window post, starts pining for the fjords, or the end of the world comes. Yes. Some people thought we were sticking a stuffed animal up behind the sign but no, Iris is about 11 or 12, she arrived here as a 16th birthday present for my son Michel who is now 25. 9) Where'd you get the sign? The Tiff Lightbox gift shop in downtown Toronto. 8) Has anyone every complained about the sign? Not yet. But there have been a couple of captions that the household censor board turned down. You'll have to ask me about them in person. I'm not going to commit them to social media. 7) Where did Iris get her name? The name came courtesy of my daughters, either Ev or Ria. I forget which. One of her eyes (Iris's, not my daughter's) is green; the other blue and her whole name is Professor Iris, but it really doesn't matter what you call her because Iris won't come because she's a cat. 6) Is there any chance Iris doesn't respond because she's deaf? You might be on to something there. Researchers have learned that a disproportionate number of white cats are deaf. I'm not making this up. Deaf white cats far outnumber deaf cats of other colours and that's why more white cats get hit by cars. They can't hear them coming. If you share your home with a white cat, it's something you might want to remember. 5) Is there a chance this nonsense — going to all that trouble, re-writing the sign, coming up with messages, having long and sometimes heated discussions with other members of the household who help compose the messages and fretting over getting photos without too much reflection in them EVERY DAY — happens merely because you want to make a terrific pun about Iris possibly being deaf and hence using Sign Language? 4) Don't you guys have another cat ? Yes, we have a skinny tabby named Kiwi. Iris is not very nice to her, but Kiwi keeps coming back for more. 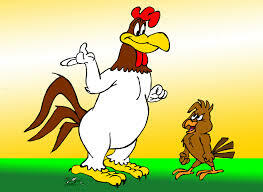 The cats have a sort of Foghorn Leghorn--Henry the Chicken Hawk thing going. 3) Isn't there somebody in your house who's really allergic to cats? Yup. Same guy who cleans Iris's and Kiwi's litter box. What's your point? 2) Have you ever tried to, like, get a cat-food company or something like that to sponsor the sign? Maybe you could get rich off it. No. We Carters specialize in coming up with great money-making ideas but never acting on them. One of these days I'm going to blog about my big brother Tom, who, a long long time ago arrived home with his invention, "the electric board." True story. It was a little squarish piece of plywood with an electric cord attached to it. We never marketed the electric board. It's just another example of the Carter money-making wizardry left to wither on the vine. 1) Who writes the signs? I love Iris! I keep checking your FB page for her signs and we are not even FB friends. (o; I have another money-making idea for you - what about a book? "The Wisdom of Iris" or such. Thanks Rondi. I'm sure the "Wisdom of Iris" would do slightly better than "How to build your own electric board." The Iris project seems to be taking on a life of its own..
Our fave thing on Facebook. It’s part of our family dinner routine!